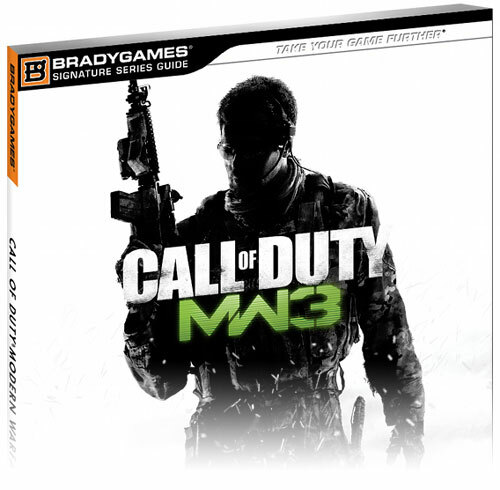 BradyGames has been publishing video game strategy guides for over 10 years and has also covered many of the Call of Duty games, including Modern Warfare 2 and Black Ops. They have been working alongside Infinity Ward and Activision for the last few months to create the official Modern Warfare 3 Signature Series strategy guide. The MW3 Signature Series strategy guide will be 352 pages long with highly detailed singleplayer and multiplayer maps, comprehensive multiplayer coverage and more. The guide is made for the Xbox 360, PlayStation 3 and PC versions. In-depth singleplayer walkthrough that has complete coverage of enemy encounters on every mission from start to finish. Shows players how to fully exploit every multiplayer weapon, attachment and perk. Detailed analysis reveals their strengths and weaknesses, and how to use them to maximum effect. Artwork and background content makes this guide a must-have collectible for any Call of Duty fan. Exclusive, highly detailed maps illustrate the levels and pinpoint mission-critical items and locations. Achievement (Xbox 360) and Trophy (PlayStation 3) rosters describe how to earn rewards and unlock special features and items. The guide will be available for purchase on 8th of November when Modern Warfare 3 launches. The standard version will cost $19.99 and the hardcover limited edition is $29.99, but it comes with extra bonus art and an A-frame map stand displaying exclusively illustrated multiplayer maps.